It is a world of perpetual, never ending darkness. Or so it would seem. Beyond 300 feet in depth, the sunlight is shut off and has been since creation. Further, it is cold – most of this dark world hovers around freezing and rarely changes. And as if to ice the cake, the world is one of crushing pressure so that humans in their element are not permitted here at all. It is dark, cold, deep and completely alien. It is called the abyss and it earns its name. 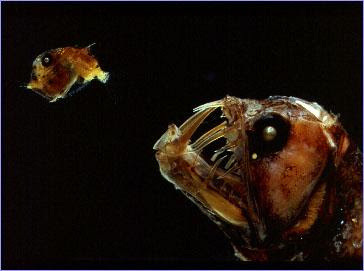 In 1930, no one had ever descended below several hundred feet here, even though the average depth of the world’s oceans is over three miles deep. But William Beebe was a naturalist working for the New York Zoological Society. He enlisted inventor Otis Barton to design what he called a “bathysphere” that would enable two men (Beebe and Barton) to enter inside, be bolted in and lowered to extreme depths. 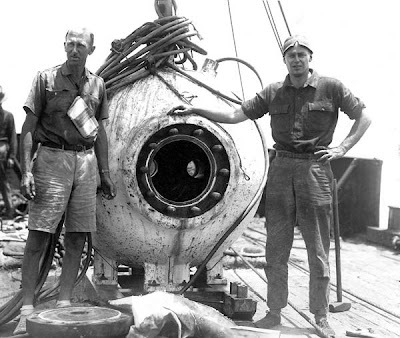 The bathysphere was a steel cylinder 4.5 feet in diameter and cast from one inch thick steel. On its face was mounted a three inch thick fused quartz window that weighed in at 400 pounds. On August 15, 1934, Barton and Beebe (age 57) made a world record descent in this ungainly looking contraption to a depth of 3,028 feet off Nonsuch Island in Bermuda. What he saw there was totally unexpected. Beebe and Barton descended to a place where no human in history had ever seen before. However, it is a place that is not at all odd. It is, in fact, the place that represents the vast majority of planet earth. It was just the first time any human had ever been there, deep in the vast three dimensional void we call Aquatica. Today it is relegated to a curious footnote in human affairs. But it was an event at least as significant as Columbus' footsteps in the new world. There Beebe and Barton were the first to witness strange creatures with huge gaping mouths and ling fang-like teeth. And nearly all creatures in this abyss came packing their own lights. Here, bioluminsecence of all colors is the rule rather than the exception. “Here there be monsters” was a quote of the ancient mariners writ large over their crude charts. How right they were. And it was William Beebe who first opened that door for all of us to see.